Any time the words “arsenic” and “food” are used in the same sentence, it certainly raises questions. Here are some common questions and answers about arsenic’s presence in food. What is Arsenic, and why might it be present in our food supply? Although it sounds scary, arsenic is a naturally occurring element in our environment that is widely distributed within the earth’s soil, air and water. As a result, very small amounts of arsenic can be found naturally in a variety of food and beverage products— including fruits, vegetables, fruit juices, grains and fish – grown both organically and traditionally. It is also detected in drinking water. The level of arsenic typically found in food and water is largely considered to be benign. What is being done to ensure the safety of the foods I eat and feed to my family? food and beverages in the U.S. are safe for you and your family. Through its Total Diet Study, FDA has been monitoring arsenic in the food supply for years. The FDA has done testing of cooked food and found arsenic at only one-twenty-fifth (.04) of the tolerance level in chicken. Further, USDA monitors the food supply for arsenic and other chemicals. USDA tests samples from chickens against the FDA tolerance level. The number of samples that have violated the level in the last 25 years is zero. Are chickens raised for meat in the U.S. fed arsenic? No. Chickens in the United States produced for meat, known as broilers, are not given arsenic as an additive in chicken feed. 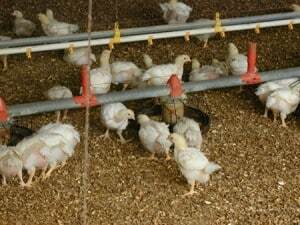 Some broiler flocks used to be given feed that contained a product called 3-Nitro, a feed medicine containing the organic arsenical roxarsone that included safe levels of organic arsenic. Even though the science shows that such low levels of arsenic do not harm chickens or the people eating them, this product was removed from the market in June of 2011 and it is no longer used in raising broilers in the United States. No other products containing arsenic are currently used in broiler meat production in the U.S.
On October 1, 2013, the marketing authorization was officially withdrawn for 3-Nitro. The decision to withdraw the marketing authorization follows the suspension of U.S. sales of this product, on July 8, 2011. I read a post on the Internet that said the “FDA Finally Admits Chicken Meat Contains Cancer-Causing Arsenic.” Is this true? The U.S. Food and Drug Administration (FDA) sets tolerance levels for arsenic in foods and beverages. The agency has never stated that chicken meat contains cancer-causing arsenic. For chicken, FDA’s limit is two parts per million in liver and other edible byproducts and one-half part (0.5) per million in muscle meat. The FDA has done testing of cooked food and found arsenic at only one-twenty-fifth of the safe tolerance level in chicken. I heard about a study that found arsenic on chicken feathers. Should I worry about the chicken I eat containing arsenic? Feathers from chickens and turkeys serve a number of purposes as byproducts of production. Mostly, they are recycled and used as a high source of protein for animal feed or as fertilizer for crops. The substances claimed to have been found on the feathers are not fed to chickens in the United States. Nor are they present in the chicken you eat. Because arsenic is widely distributed in our air, soil and water, it is not surprising that trace levels of it were detected on birds’ feathers at levels that have been shown to be completely harmless to humans. This study has also been widely criticized by members of the scientific and academic communities. Consumers should know that chicken is safe, wholesome and that all chicken produced in the United States is inspected by the USDA. Inspectors test meat samples for chemical residues; all poultry must be in compliance with USDA standards before entering the marketplace. Chicken consistently has the best record of any meat product tested for residues by USDA.